As much as sometimes we think our pizza tastes like garbage, we don’t order it that way, nor would anyone make your pizza out of garbage. In designing chatbots you need to expect the unexpected, plan on what people might say not just what they would or can say. In designing the chatbot conversation plan also think of the end of the conversation not just the beginning. Before we get into features let me provide a word of CAUTION, always give the user a way to escape or escalate to a real live human at any time easily without a lot of bothersome and annoying comments. The purpose of a chatbot is to help your customers not just reduce your costs. Seriously if users think you are “playing” them for a fool, then you have just wasted a lot of time and money and worse probably alienated current customers and future ones. A chatbot is not a person and cannot ever be one, so set the expectation that the chatbot is a “job aid” to both the customer and the company. Job aids have been around for centuries, like rules of thumb to “add grease to the squeaky wheel” and so on. Start with simple tasks and as the chatbot gains in skill and practice as well as positive customer feedback, then expand its role as well. You don’t send an untrained soldier to the battle field, nor an untrained support person to handle level 3 requests. Make sure you know what the agent or sales person knows first and use the chatbot internally first before embarking them on facing a customer. – What is the closest store to my address? – Can you help me find locations in the general area of downtown (city name if important or relevant)? – Can you tell me about physical locations you have in (name of state, if important or relevant)? – Do you know your reservation number? – Do you need car insurance? – Would you like to ….? – How can I help …..? Often asking for potentially the widest possible number of inputs might not work but as you grow the conversation with the user you can explore news ways to engage with them. – Do you know where they electrical breaker box is? – Would you like to know more about how electricity is provided to you place? 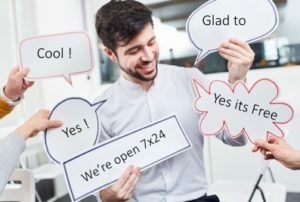 The educational approach is largely overlooked as chatbots are initially focused on transactional activities, however, educating customers represent a great way to provide information on the operations of your business and letting customers know how you really work to help them. Greetings and goodbyes – start with basic welcomes and thank you messages. All too often forgotten is the way we start and end meetings. Like “how’s your day, how are the kids and general “how are” inquiries. Then we talk and at the end, we often say “have a nice day, safe travel, let me know how else we can help, join our mailing list, we are having a sale and other common salutations. In today’s fast-pace rapid fire business environment, we rarely use the word many of the great phrases of long ago like sincerely yours, Dear Sue, wishing you the best and others though we have replaced them with emoticons which may as good as the words that portended to represent. Naïve approach – take an innocent approach to set the expectation of the user. May be like this “This is an example of a chatbot we can build for you. It comes in many colors and sizes and has lot of things it can respond if you like teaching a child you make sure it knows what to say :).” Setting the expectation to a minimum like with any teaching experience is a good start. Assume they know nothing and you know nothing about them. Education approach – interview and explore with customers who come to your website no knowing what they are looking for but want help is a great foundational approach to your chatbot. That is, you may not think so, but most websites are designed from the company’s perspective not the customers. Websites are “window dressing” not always what the customer needs or is looking for. Of course, if your website is transactional, customers want to know about “shoe sizes” but if your business is complex business services with many options then the website makes the decision-making process more, not less complicated. One vision expressed by content delivery innovators is to replace the website with a search bar and a chatbot. Realistically that will not happen as marketing managers love all amazing amounts of content found in their website. 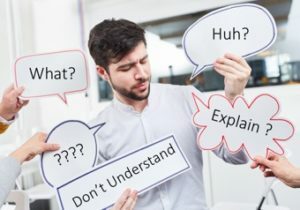 3 – Entities, refined, options or alternative responses – this is where the user may want to know how two concepts or different ideas like “shoes and pants” fit together, “should I get my mother and my wife the same flowers.” That is an entity can dig deeper into the question or inquiry. I like to use the term Options rather than Entities as this is the way the chatbot can explore more details from the user about what they are looking for. Assuming you know what they are looking for or want is a major question that you should address before exploring this “line of questioning” to the inquiry, You don’t want the user to spent a lot of time with you and then be told “we don’t have information to help you, so you need to speak with an agent.” Imaging your own feelings when being told that ! In other words, KISS – keep is simple stupid is even more relevant to chatbot conversations that human communication. Designing options is rather complex and beyond the scope of this article, however will leave you with the idea that start with the end of the chatbot conversation in mind first, then build dialogs and responses, test them and test them again to try to avoid any dead ends or box canyons. 4 – Library, Catalog or Directory – think of conversations like articles or books in a library and one approach will suit all circumstances. Like in sales training, different customer examples that are used to depict the different customer settings the sales person may encounter. Creating conversation or script libraries whether by customer type, use case, company department, industry and others can help build the communications chatbot catalog. Obviously, the written word has different nuances than then spoken word and just because you read it you wouldn’t say it, nor might the customer understand your own form of corporate techno-babble. However, by creating and collecting conversation libraries can be of help as you expand the number of type of chatbots in your organization. Skill in writing movie or TV screenplays might be useful to provide background and preparation for a building a chatbot. Watching movies and TV would be helpful in understanding to get the garbage out of dialog and better communications in to the mix. In animation, you learn to think “backwards” working and knowing the end before you start the beginning. That is, build your chatbot from ending not just the beginning and make sure you like any good movie have many different endings in mind. Summary – In order to keep this introduction to less than five minutes, I want to end now and hope that this article can give you insights into your own chatbot development process and look forward to any feedback you may have.